Until 1852, the equipment of the fire department were kept in Grötzinger City Hall. In the ever less used wine at the Feast of place at first showed the possibility of better accommodation. However, only after the destruction of the old building in 1944 a new building was erected. According to the plans of the local architect multi-country in 1951 as a spacious fire station with three exit gates, one administrative space, an apartment for the serviceman and a twelve-meter-high hose tower (photo above). Only since 1874 are in Grötzingen a fire department. Before the delete was being distributed over the inhabitants of the village. In each district there was a fire to First Sergeant, who divided the volunteers on the various activities. He distributed the tools, such as axes, fire hooks and long forks. The roads to the fire were lit at night with torches and pans and each brought their own leather bucket for transporting water from the public fountains to fire with. The mayor and the chief official was responsible for the equipment and the new acquisitions. 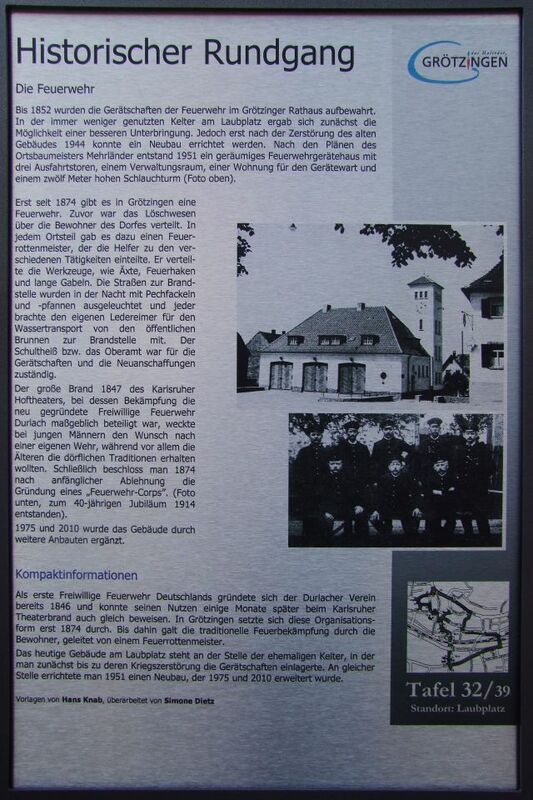 The great fire in 1847 the Karlsruhe Court Theatre, in its fight against the volunteer fire department Durlach newly established was heavily involved, aroused in young men the desire for its own defense, while especially the older ones wanted to preserve the rural traditions. Finally, it was decided in 1874, after initial refusal, the creation of a "fire brigade Corps". (Photo below, the 40-year anniversary in 1914 originated). 1975 and 2010 the building was supplemented by further additions.